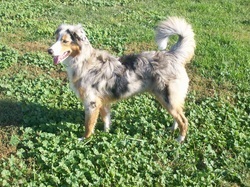 Blazin Bobby Socks, aka "Blaze" comes from the number 1 and number 4 lines of Aussies in the country, according to her breeder. 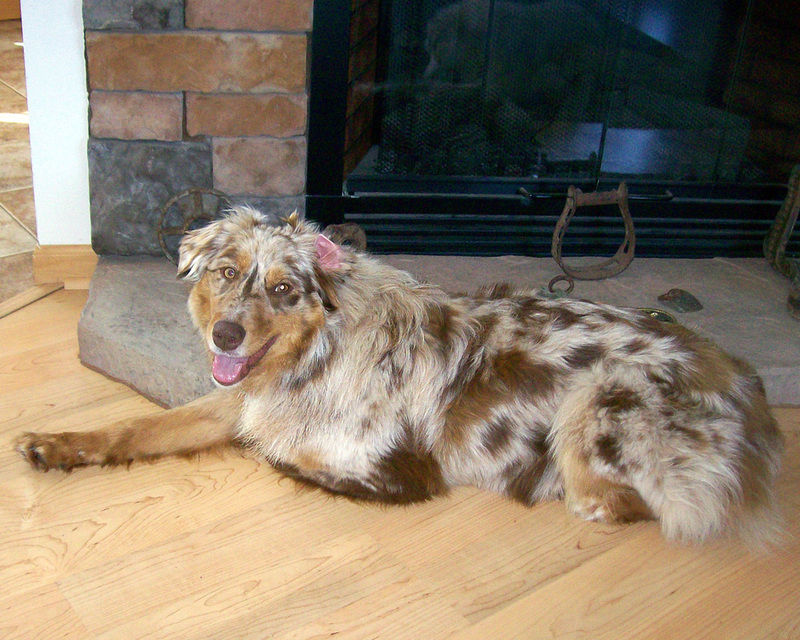 Her coloring is considered a "Yellow", which is a recessive red gene in the breed. I love her coloring and purchased her because of that and her terrific conformation. She has a lovely temperament, a beautiful coat, and is my constant companion. Click HERE for more pictures of Blaze. 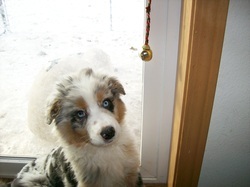 Lizzie Keepsake's Dandy, aka "Lizzie" is a beautiful blue merle lady with one blue eye and one partially blue and partially brown eye. 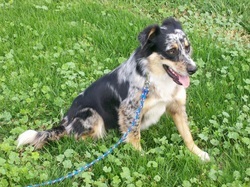 She is Cinder's mother, and we are excited to welcome her to our kennel. 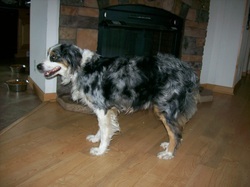 We expect some lovely, beautifully colored Aussiedoodle puppies from her in the future. Click HERE for more pictures of Lizzie. Sand Lake Sparks and Cinders, aka "Cinder." It will be some time before Cinder joins the ranks of our mothers, but we are hoping that she turns into the lovely young lady we anticipate her to be. She comes from a combined working dog and show dog background so we are getting the best of both worlds, along with her beautiful coloring. We can't wait to see what she will become as she develops! Click HERE for more pictures of Cinder. 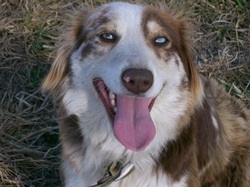 Sadie is a Miniature Aussie, a very pretty girl with one blue eye and one blue/green marbled eye. She is a very dedicated dog that listens terrifically well and is a wonderful livestock dog. Her prior training was on herding goats, but at Sand Lake Kennels she enjoys going for rides in the truck and visiting in the house. Being a miniature, she is very petite with little "cat paws" and stands 19 inches tall and weighs 35 lbs. Click HERE for more pictures of Sadie. Harlee is a first generation cross Standard Aussiedoodle, sired by our AKC registered Standard Poodle "Jake" and out of "Red", our Standard Australian Shepherd. Harlee is a red merle girl, born July 3, 2012. We are looking forward to eventually raising some F2 (second generation cross) puppies when she is old enough. Click HERE for more pictures of Harlee. Bella Blue is a first generation cross Standard Aussiedoodle sired by AKC Standard Poodle "Jake" and out of Lizzy Keepsake's Dandy, our Standard Blue Merle Australian Shepherd. She is an example of a medium haired Aussiedoodle. 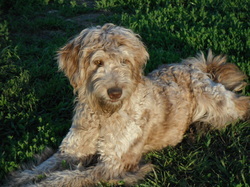 When crossed with a Poodle, she will produce 2nd generation (F2) Aussiedoodle puppies. Click HERE for more pictures of Bella. This is Quinn. She is a Texas Heeler, a wonderful hybrid cross of Australian Shepherd and Australian Cattle Dog, commonly referred to as Blue Heeler. The Texas Heeler's origin began with the Animal Research Foundation; Lucy Guynes, Weatherford, Texas was the first to register the Texas Heeler with the Foundation in May, 1970. The Texas Heeler is a smart, agile, athletic herding dog that makes a wonderful working farm dog and family dog. Plans for Quinn will be to cross her to Remi, our Standard Poodle. Click HERE for more photos of Quinn. Greta is our young Standard Poodle sired by Jake and out of Miley, a black and white parti-colored poodle. We call her "Greta the Clown" and the name fits! She is a total charmer and spends her time playing and being a goofy big house dog. We just love hearing her big ol' plunky feet plopping around our hardwood floor. When she is tired, she flops down like someone shot her legs out from under her. She is truly a fun, fun dog. Bobzien's Irish Creme; aka "Jake" is our AKC Standard Poodle sire. He is the current daddy to our puppies. Jake is a gorgeous mover with a beautiful face. Being a "Standard", Jake is a larger dog standing 25" tall. He has a terrific nose on him that he is putting to good use as he cruises the acreage. He is very obedient and loves playful. Sand Lake Remington Steele; our Jr. Sire. Remi, as we call him, is a beautiful silver boy that has joined the kennels. He is a beautiful boy whose coloring should blend extremely well with our girls. We look forward to seeing what colors we will get. Click HERE for more pictures of Remi. Sand Lake Lexis is a retrieving demon and a very people oriented dog. She has joined Jon and his French Brittanies in the hunting field, but she also does double duty raising Goldendoodle puppies. If you are a Goldendoodle fan, please let us know and we will be sure to keep you in the loop. Click HERE for more pictures of Lexi.